Calculator Free is a free Windows 8 calculator app with basic functionality for addition, subtraction, multiplication, division, and percentage calculation. The app is simple and easy to use and has a good background design. 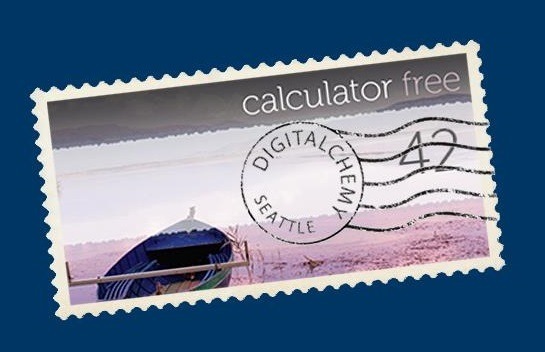 This free Windows 8 calculator app lets you perform calculations in a simpler, quicker, and easier manner. You can see the calculation steps in gray, and the results in black color. The app remembers the last calculation on which you were working, and loads the same when you launch it the next time. Plus you can also copy and paste values to and from the app. You can snap the app either to the right or left side of your window screen. The app’s live tile on the start screen displays the last calculation you did on the app, and therefore helps in viewing the calculation at a glance, without opening the app again. 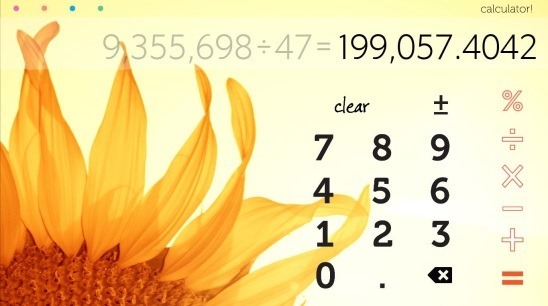 This free Windows 8 calculator app is equally good for both kids and adults. You can get this free Windows 8 calculator app under the Productivity Category in Windows Store. 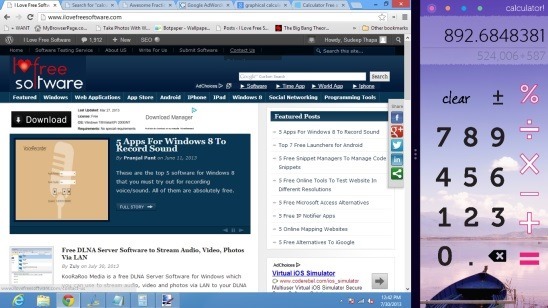 The app runs on the Windows 8 platform, so you can easily run it on your Windows 8 PC, laptop, or tablet. The app’s interface is simple and elegant. All the numbers and the operators (+,-,X,/,%) are well laid out. And the fact that the numbers are big in size, makes the app even more usable for everyone. As people with weary eyes can also use the app and read the numbers. One feature that distinguishes the app from others is that, it has four beautiful pictures of nature, that can be easily switched and used as background. Using this free Windows 8 calculator app is just like using the real world calculator. Performing calculations is easy, clean, precise, and fast. Simply enter the 1st operand, specify operator, type the second operand (if exists), and click on Equal to sign. You will see the progress of the calculation on top of the app’s screen, along with it’s result. Free Windows 8 calculator app. Numbers displayed in big size. Can be used in snap mode. Easily add, subtract, multiply, divide, or calculate percentage. Saves and loads the last calculation entries on launch. Live tile update on Start screen shows last results. Clear calculations and easy to read and type numbers. Calculator Free is a good Windows 8 calculator app, which comes handy in many scenarios. The app works great and does what it’s supposed to do. Using the app is easy, clear, and quick. Also the app is visually attractive. Though if the developers had added more calculation options like finding roots or fractions, it would have been a great app. Still it’s a good free app with lot of usability and simplicity. Also check out Awesome Fraction Calculator app for Windows 8.